As in any scene, bands form, break up, and share the stage with each other, and the strong sense of community felt by the Lookout alums runs through the pages. 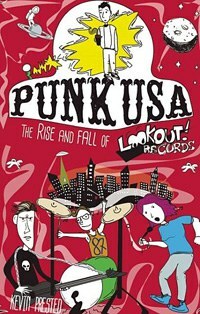 Kevin Prested’s Punk USA: The Rise and Fall of Lookout Records begins with Green Day. How could it not? If you found yourself under the sway of whoa-ohs and single-note guitar solos any time between 1994 and the present, you probably started there, too. Green Day ushered in the heyday of pop punk by dominating MTV and slinging mud at Woodstock 1994, and they paved the way for a wave of lesser bands who were a lot more juvenile and a lot less fun. The band’s real impact, though, was as a gateway to Lookout Records. Prested writes, “Green Day and Lookout offered something more than just sound: they opened an accessible avenue into underground music.” Seeing Green Day bassist Mike Dirnt on MTV in a Screeching Weasel t-shirt was like having a cool older brother who couldn’t beat you up. Founded in Laytonville, California, in 1987, Lookout Records found its sonic home in Berkeley’s punk rock nexus at 924 Gilman Street. That scene spawned bands like Operation Ivy, Crimpshrine, Isocracy, and Green Day. Their records all bore the Lookout logo, including Green Day’s first two, 39/Smooth and Kerplunk. The label originally showcased bands in the Bay Area, but the roster eventually increased to include releases by Screeching Weasel, the Queers, Cub, Avail, and Ted Leo and the Pharmacists. Green Day made the jump to a major label in 1994, and their success sowed the seeds of Lookout’s phenomenal success -- as well as its undoing. Prested gives us an oral history of Lookout as told by bands and employees of the label, and it was always much more than Green Day. As in any scene, bands form, break up, combine with other bands, and share the stage with each other, and the strong sense of community felt by the Lookout alums runs through the pages. Missing from the proceedings is the label’s founder, Larry Livermore, but he’s written about his experiences with the label in his own book, Spy Rock Memories. Also missing are the voices of the members of Green Day. Whether they were unwilling or unable to participate is not mentioned, but their input would have added a nice dimension to the story, an inside/outside view of the explosion of early '90s pop punk. The book doesn’t suffer because of their absence -- the band was only on Lookout for a short period relative to the life of the label -- but the specter of the band permeates so much of the label’s fortunes post-Dookie. Bands like Screeching Weasel and the Queers and the Mr. T Experience sold their fair share of records, but Green Day and, to a lesser extent, Operation Ivy, practically hemorrhaged them. After the 1997 departure of Livermore and his business partner Patrick Hynes, Chris Appelgren became the label’s sole owner and president, and his voice dominates much of this book. He was with the label nearly from the beginning, but because he presided over its downfall he comes off as the villain, although his role is more of a bungler than a dastardly moustache-twister. He’s always quick to point the finger at himself. Rather than ripping off artists wholesale, Appelgren made an increasingly expensive series of decisions, funded almost entirely by cash earned from the sale of Green Day and Operation Ivy records. The purchase of Ben Weasel’s Panic Button imprint, signing bands that generate buzz or broke up after their records came out, and not paying Green Day or anyone royalties on time, created the perfect storm of financial woe. The label used money owed to the artists to maintain the business and fund new releases. According to Prested’s reporting, the label may have blown something in the neighborhood of $50 million, most of that earned from Green Day and Operation Ivy, between 1991 and 2006. That’s staggering for any business, but it’s mind-boggling for an independent record label. Looking back, it seems like no one involved with the label was prepared for the sea change that hit the music industry after the turn of the century. The book starts to lose steam by the end, much the same way the label did after years of inactivity. However, despite the label’s official demise in 2012, this is a hopeful story. It shows how punk/DIY ethics can succeed, but it also shows how those ideals can get in the way of practicality and good business sense. That hopefulness is ironic, because Hopeless Records now owns the intellectual property of Lookout. This book isn’t about pointing fingers and labelling anyone a sellout, which is what might have happened if it were written 20 years ago. Then, at the height of the label’s popularity and the beginning of Green Day’s broad mainstream success, the term meant something. Or it didn’t. Maybe that’s never really been a consideration for anyone but the crustiest of punks.